Model: Yongnuo YN1410 Standard 1/4 Screw Socket. Note: The socket is positive inside and negative outside+ -, the positive and negative poles can not be reversed, otherwise the immediate damage will be caused. 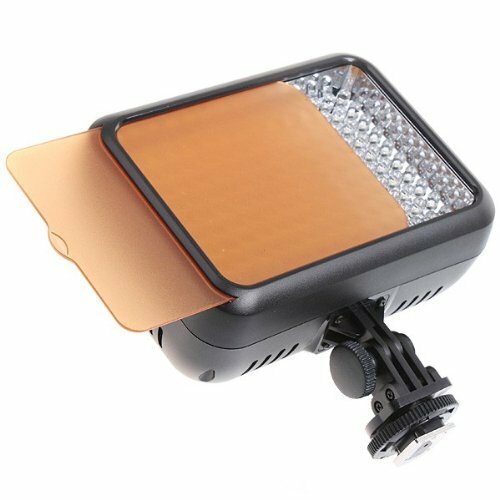 This LED light fits all brands of camcorder or digital cameras with standard shoe mount. It's small size, low weight and convenient for carrying. 140 pieces of high brightness LED lamps. With two different colors of temperature sheets ( orange and white). It creates excellent effect in shade environment. Energy efficiency, low heat consumption. The brightness can be divided into 16 grades.